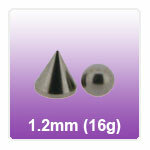 A range of replacement parts and spares for standard 16g body piercing jewellery. Replacement balls, jewels, spikes, cones and other screw on attachments for eyebrow bars and facial labrets. "My wife was thrilled with the purchase of 4 non piercing SILVER AND GOLD ELEGANT BUTTERFLY AND SILVER AND GOLD CROSS AND DAISY naval jewelry sets...."
"Fantastic service as normal very quick delivery within 4thrs as normal . Highly recommend 100%"
"The Product sent and the service from Jobananas was amazing. The best customer service I have dealt with in a very long time. The product was..."
"arrived before expected and well packaged"
"Great service (delivered next day), great price and exactly what I wanted"